Listening to the speeches of the top three students who finished the Job Enabling English Proficiency (JEEP) Program gave the audience a natural high. The students exuded relaxed confidence and spoke in impeccable, clear English. They told of how the program honed their English communication skills; helped build their self-esteem; and opened their minds to greater possibilities for themselves. 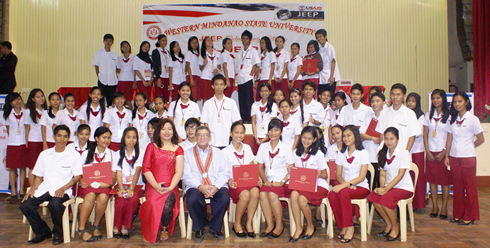 They were part of at least 300 pioneering students of the JEEP program coming from various colleges of the Western Mindanao State University (WMSU) who were awarded certificates of completion during the first culminating activity held on April 3 at the Dr. Juanito Bruno gymnasium, WMSU campus, this city. The following top ten graduates were given recognition: Joe James M. Alob (BSED); Kent Jestoni Q. Gabo (BSED); Evanessa Z. Villacrucis (BSED); Vickylou S. Ferrer (BSED); Wesley M. Perez (BSED); Medallon A. Rasonabe (BSED); Justine Kaye D. Rojonan (BSED); Elvin D. Enriquez (BEED); Micah Ezra N. Chang (BSED Physics); and Therese Mae D. Trayvilla (BSED). JEEP is a two-year non-degree English language proficiency project of the USAID’s Growth with Equity in Mindanao (GEM) program, in partnership with WMSU and 25 other colleges and universities in Mindanao. It aims to increase the graduates’ employability in industries that require English language proficiency particularly in such growing sectors as nursing, hotel and restaurant services, tourism and travel, maritime, and business process outsourcing. The program utilizes the Dynamic Education (DynEd) interactive modules. For this reason, the teachers involved underwent a training on the DynEd technology. Likewise, WMSU provides a JEEP laboratory equipped with computers in addition to USAID GEM’s counterpart. Mr. Robert E. Barnes, Economic Advisor, USAID Office of Economic Development Governance, hailed WMSU President Dr. Grace J. Rebollos who willingly accepted the program in 2009, having discerned JEEP’s great potential of helping make WMSU graduates, globally competitive. He was the guest of honor of the JEEP culminating activity which was also graced by Mr. Michael G. Langsdorf, Deputy Program Manager for Workforce Preparation and Governance, GEM Program which oversees the JEP Program implementation. Barnes said that years ago, it came to their attention that a large percentage of Filipino professionals had difficulty passing English proficiency tests required of professionals applying for work abroad. He said this made his team think of ways to be of help. “Clearly, having a degree was no longer enough for graduates to land good jobs in the growing sectors,” Barnes stressed. This gave birth to the JEEP program, he revealed. “The results (of the program) show we are on the right track,” Barnes said. According to him, he is very happy to hear of the story of the Hotel and Restaurant Management (HRM) students of the WMSU College of Home Economics (CHE) who breezily passed the interview for internship in Singapore hotels. The students, who have undergone the JEEP Program, impressed the interviewers with their confidence and excellent English as they responded to questions. But the real test, according to Barnes, will be the actual percentage of graduates who will land good jobs in the global job market because of the English proficiency they have gained from the program. Barnes, commended Vice President for Research, Extension and Development Dr. Milabel E. Ho under whose supervision the JEEP Program is being implemented through the Language Development and Resource Center (LDRC). Most of all, he congratulated LDRC Director, Prof. Julie Cabato for doing a splendid job as WMSU JEEP Program Coordinator. Prof. Cabato works with a team of competent English teachers composed of Ms. Pilar S. Caparas, Dr. Lea U. Laput, Prof. Myrna Joy B. Mendoza, Ms. Alice D. Gonzales, Ms. Ruzzel L. Nazario, Ms. Susan L. Ramos, Mr. Ericson O. Alieto, Ms. Fhadzralyn L. Aidil, Ms. Haydeliza T. Magtupa, Mr. Mark B. Selisana, Ms. May-Ridel A. Pinili, Ms. Raissa M. Ponce, Ms. Pilar T. Rosaldo, Ms. Analine R. Fernando, Ms. Rodita Silva, Ms. Roxan R. Adrias and Ms. Czarina Longakit. Engr. Antonio Angelo Limbaga, Director of WMSU’s Management Information System Technology Office (MISTO), is the program’s Information Technology Coordinator. Meanwhile, Zamboanga City Mayor Celso L. Lobregat, through his representative, Councilor Rudy Lim, Chair of the Sangguniang Panlungsod Education Committee, lauded the JEEP Program and thanked USAID GEM for introducing it in the city.